Our friend Doug Herst’s bike was swiped from the Koffee Klatsch in Fairfax Saturday, June 5. Another friend lost his Rivendell there earlier in the week. There might be a thieving operation culling the crop of bikes laid against the shop windows, making me wish there were cameras trained on the side of the building, as WELL as at the traffic light. Nothing matches the kick in the stomach feeling of a bicycle stolen. OK, wait. There are some things worse (BP oil spill, death of a child, right….must keep things in perspective). Still, most people will tell you it’s way worse than having a car stolen (perhaps this is because I belong to a very biased segment of the population). 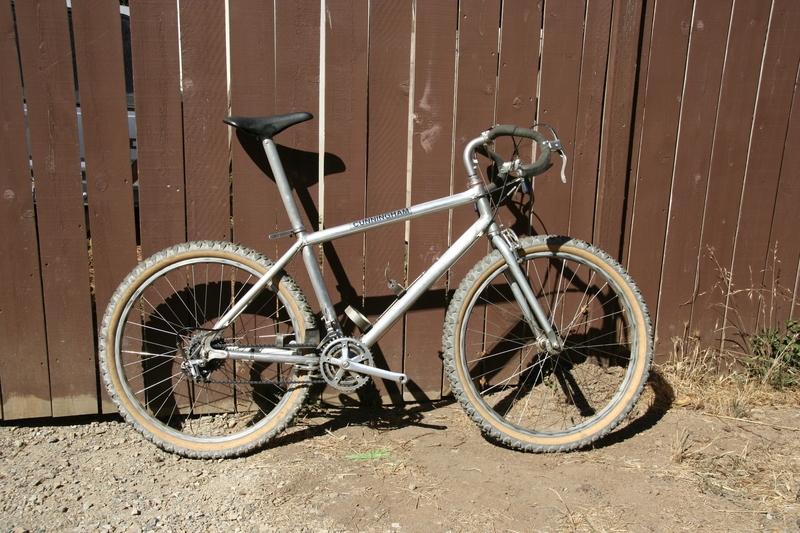 It’s an unpainted gray aluminum (impeccably maintained for 27 years) fat-seat post (not seen often), drop-bar mountain bike with a type 2 fork …No pictures of the bike exist, so I’m just putting up one of CC’s…. ~ by jacquiephelan on June 7, 2010.
ooof – horrible news, hope it shows up. It always befuddles me what happens with stolen bikes like this. Where do they go – something truly unique, anyone ‘in the know’ will realise that it’s not genuine. Anyhow, hope Doug gets his bike back and sending my best to you and Charlie from the UK. WTF, this is terrible! But not entirely unexpected. There was a spate of thefts by the depot in MV a couple years ago as well, wouldn’t surprise me that Ffx downtown is a prime spot as well. Way too easy to walk/ride off with a bike with all the bustle over by the Scoop. Thing I hate most about getting a bike stolen is the pit in your stomach that follows you around for months afterward, every time you see a familiar-looking bike out the corner of your eye. Exactly like that feeling you get when you keep thinking you’re seeing an old flame after a bitter breakup… but I digress.